Google now showing +1 Counts and ads the local aspect: ready for spam? 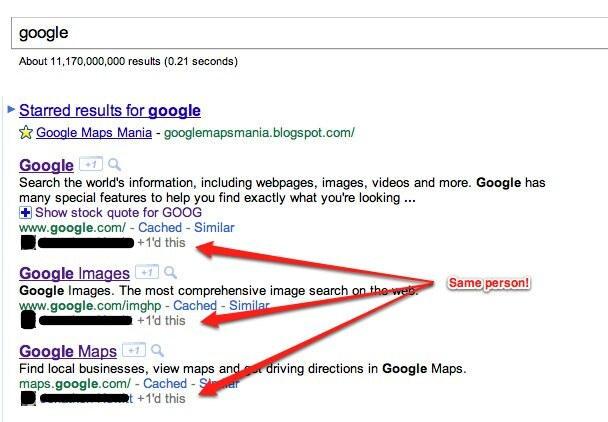 Searchenginewatch reports that Google is making another step in integrating social into their search results. Again it has to do with the +1 button. Searchenginewatch editor Danny Goodwin noticed that Google has started to put number of +1’s sites have received in their search results. I haven’t seen then myself, but Danny reports he saw it “Safari on a Mac and IE7 on a PC, not logged in to Google.” Which seems kind of surprising since until now you have to be signed in to Google to actually see the results. Are you ready for spam? The step means that the ‘battle’ for the +1s now can come lose. The number of +1s next to a result will without a doubt trigger people to get more +1s for their site. This will without a doubt make for more spam. I already noticed some people trying to influence their social circle by +1-ing everything on the first page of a popular search term so that they would show up. This is not cool and an example of spam which Google will have to deal with.